photoresists, solder masks and Alucorex. 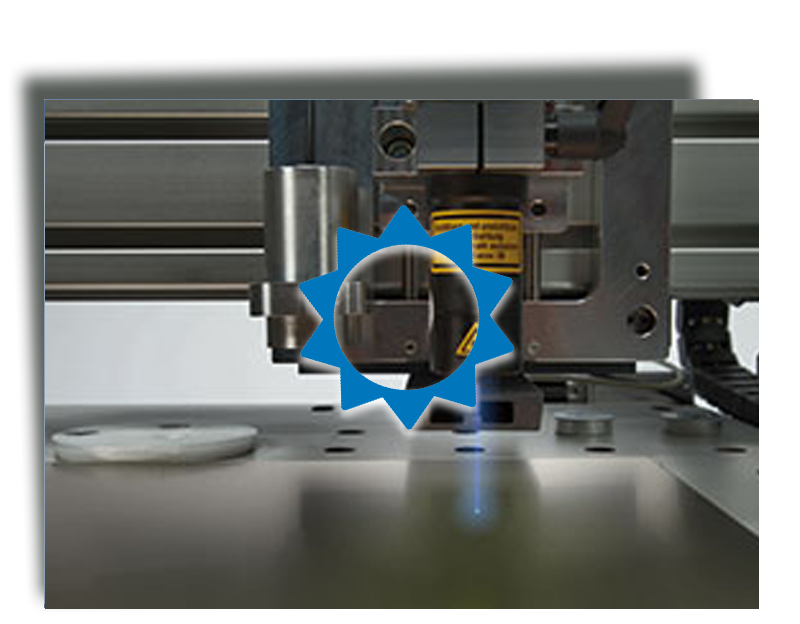 The laser is mounted into the spindle holder instead of the high frequency spindle and is controlled by the RoutePro 3000 software. The Bungard laser exposure unit is an answer to the demand of many operators for higher precision, faster processing speeds and reduced tool costs, as it is the case for example with isolation milling. To use the laser functions you need to connect the laser to the CCD and activate a laser license. The laser moves similar to routing along HPGL vectors. With the travelling height the line width and with laser intensity and travelling speed the exposure intensity is defined. We recommend to adjust the step resolution to one eight in the software RoutePro 3000. The laser exposure unit may only be used in connection with a CCD. The laser can only be switched on, when it is correctly installed into the spindle holder of the CCD. The laser itself has a power 120 mW and is classified as laser class 3B. The laser is set into the CCD in a way, which makes it impossible to look directly into the laser light. Note: the laser exposure unit may only be operated in a closed rack or hood. Please observe the general rules for handling electronic parts, especially ESD-protection. Before touching the laser head, perform a potential compensation. E.g put you both hands on an ESD-suitable support before removing the laser from the package. You need to do the same, before you reassemble the laser from the machine. By bad conditions like, PVC flooring and shoes with plastic soles, high static charges can occur. These could damage the laser head.